Submitted by Taps Coogan on the 22nd of October 2018 to The Sounding Line. It is no secret that Italy’s new populist government has been calling for increased deficit spending in order to jump start the country’s economy. The ECB is insisting that Italy do the opposite. The impasse has thrust Italy’s troubled economy back onto center stage. Italy’s new government has framed the country’s economic problems as the result of the Euro and the Eurozone’s imposition of austerity upon Italy. The implication is that more deficit spending and perhaps even abandoning the Euro would alleviate Italy’s economic woes. While the Euro has been no friend to Italy’s economy, little else that the Italian government has done for the past several decades has been of much help either. 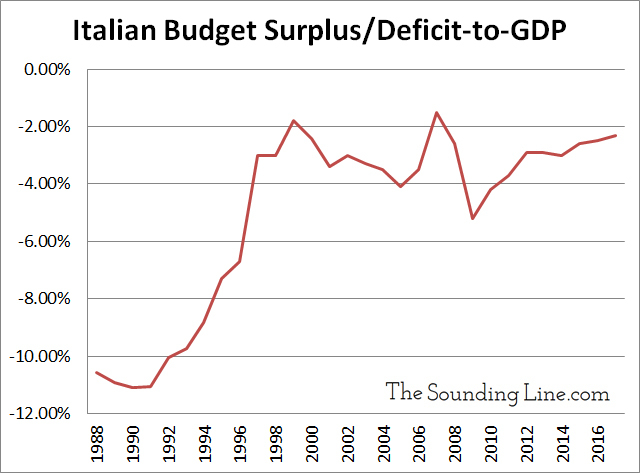 Italy hasn’t run a budget surplus in at least 30 years. If deficit spending was what Italy’s economy needed to grow, it would already be one of the fastest growing economies in the world. It is not. 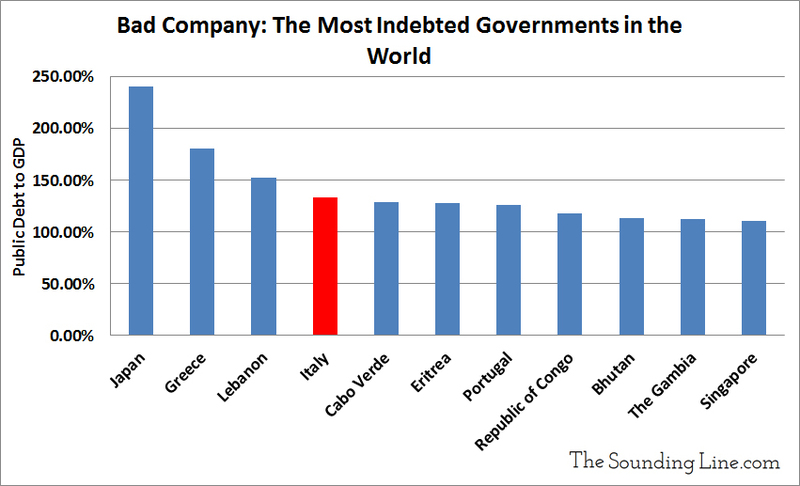 Owing to its endless deficits, Italy now has the fourth highest public debt-to-GDP ratio in the world, just behind Lebanon. Meanwhile, Italy has been the 5th slowest growing economy in the world since 2000. Between 2000 and 2016, Italy’s economy grew 1%, not per year but in totality. The only countries in the world that have done worse are Yemen, Zimbabwe, Greece, and the Central African Republic. Meanwhile China grew 325% and the US grew 33%. To make matters worse, Italy has not created a single net new job in over a decade, wages are falling, and it has the 10th highest level of non-performing loans in the world. The oft-repeated soundbite that Italy has been enduring austerity is nonsense. Italian government spending has increased every year since 2010, both in absolute value and per capita, and Italy’s deficit-to-GDP is 33% larger than the EU average. In order to finance Italy’s perennial deficits, the ECB has pumped money into the Italian financial system faster than the entire Italian economy has grown for years. In fact, the ECB has been the largest single net buyer of Italian government debt since the Euro was created. Relative to its economy, Italy has been the third largest beneficiary of quantitative easing in the world after Japan and Switzerland. Italy’s economy has languished because it is massively over taxed and regulated. Italy has the fifth highest overall tax burden in the world and has the second highest payroll tax rate among developed economies. Italy ranks a dismal 79th for economic freedom, the second lowest in the developed world and below the likes of Kyrgyzstan. It ranks 49th for economic competitiveness, and 45th for business friendliness. With an average age of 47 and rising, Italy is tied with Germany and Japan as the oldest country in the world and Italy’s population began shrinking in 2016. Italy also suffers from the lowest ratio of workers to elderly in the developed world. There are barely more than 1.5 people with a job for every person over the retirement age in Italy. Meanwhile, worker productivity is lower than it was a decade ago. As if that isn’t bad enough, Italy’s new populist government will be lowering the retirement age to 62 despite the fact that Italians enjoy the third longest lifespan in the world. Apparently, the new government wants Italy to go out with a bang. The Euro has not helped Italy’s economy. Neither have the extra layers of regulation that come with being in the EU and Eurozone. However, those factors have only exacerbated Italy’s underlying economic problems, not caused them. The recent inclination of many Eurozone critics to condense the totality of Italy’s problems down to the Euro and ‘austerity’ is entirely missing the point. The tax, regulatory, and monetary policies for which the EU is so often criticized can be found in greater abundance in Italy, than anywhere else in the EU. The one thing that is not on the table in the current negotiations between the ECB and Italy is the one thing that Italy badly needs: a plan to make it economically competitive again. Instead, Italy will be going ahead with its new plan to offer free money to everyone and early retirement for anyone that is still showing up for work. Good luck with that.